The Parti Australian Labradoodle has unique characteristics. It’s coat is at least fifty percent white, with spots and patches of any other solid color. No set pattern is required but symmetrical markings on the head are preferred. Barksdale chose to develop a top line of Barksdale Parti’s a few years ago. The Australian Labradoodles were started and continue today to fulfill a need as Hypo-Allergenic and Non-Shedding Canine Assist. As time progressed not only did the Australian Labradoodles serve as Canine Assist they also became “Designer Dogs”. We became enamored with some of the really attractive Parti’s in North America and decided that Barksdale should offer this appearance to our potential “Forever Homes”. Jacqueline started a thorough search of the Australian Labradoodle Breeders that might have Pedigree’s we would be interested in. Ultimately we found the nucleus of Parti’s we wanted. The qualifications were: Minimum 4 Generations Health Testing, Minimum Freckling in the white, Multi-Generation Australian, the other Color Chocolate, Therapy Level Temperament, Correct Gene Dominance, and Size of Miniature to Small Medium. Barksdale then purchased this nucleus of 1 male puppy and 2 female puppies. These pups came from the Northwest USA, Eastern USA and Quebec, Canada. Today we are involved with our 2nd and even 3rd generation of “Barksdale Parti Australian Labradoodles. The line is continually enhanced with outside infusion. We thank our friends “Stephen & Kristin Bower at Ivylane Labradoodles” for their assistance. How This Will Affect Our Forever Homes. The addition of another line of Barksdale Authentic Australian Labradoodles will broaden our reach to more Premium Purchasers. They have asked for this line and we are pleased to finally present these gorgeous Barksdales to the Barksdale Families. The litters that have been whelped are everything we desired and lead us to be excited for the future of the Barksdale Parti line. Barksdale’s Tinder Spark is a Barksdale Multi-gen Australian Labradoodle (ALd) miniature in size with a beautiful appearance and a Soft – Sweet disposition. This beautiful tiny girl was born 28 December 2018. We are so pleased with this little girl. She is the 3rd Generation of our Parti line started by Ivylane Elfin Willow. Spark is a small miniature and should grow to be about 14.5 inches in height. This wonderful little girl lives with her Guardians (Evans) in Hattiesburg, MS. Spark has a fleece parti (chocolate and white) coat (bbEE carries the brown gene does not carry the black or cream-white-red-apricot genes) and a wonderful and loving personality. Her coat is hypo-allergenic and non-shedding with a wonderful soft texture to it. Ivylane To The Moon and Back is a Barksdale Authentic Australian Labradoodle (ALd) small standard in size with a soft open fleece coat. She is so appropriate for our line of Parti’s and her personality is wonderful. This girl was born 18 March 2018. Moon has a fleece parti (chocolate and white) coat (bbEe carries cream-white-red-apricot genes). Her coat is hypo-allergenic and non-shedding with a wonderful soft texture to it. This wonderful Barksdale lives with her Guardian Family (Faler’s) in Florence, MS. Our thanks to Kristin of IvyLane Labradoodles for allowing this wonderful girl to be part of “Barksdale”. CAER Normal, vWD Clear, DM Carrier, DNA Profile, Bb or bbEe, DM Clear, IC Clear, Parti sp sp, PRA/PRCD Carrier, EIC Carrier, PennHIP, OFA Elbows Normal, and OFA Thyroid Normal. Barksdale’s Lady Loclyn is a Barksdale Authentic Australian Labradoodle (ALd) miniature in size with a distinctive , beautiful, soft open fleece coat. Her mostly white coat is offset with gorgeous chocolate head that makes her as beautiful as is her personality. This beautiful “attractive” little girl was born 09 February, 2018. We are excited about the future of this darling little girl and are thrilled with her coat and personality. Lady is a miniature. Lady has a fleece parti (chocolate and white) coat (bbEe). Her coat is hypo-allergenic and non-shedding with a wonderful soft texture to it. We are proud to have this wonderful little girl as an upcoming part of Barksdale’s Guardian Program. This wonderful little Barksdale lives with her Guardian (Buccianti) in Ridgeland, MS.
CAER Clear, CBC, vWD Clear, DNA, bbEe, DM Clear, IC Carrier, Parti sp sp, PRA/PRCD Carrier, EIC Clear, PennHIP, OFA Elbows, & OFA Thyroid. Ivylane Shandy is a Barksdale Authentic Australian Labradoodle (ALd) small medium in size with a soft open fleece coat. She is so appropriate for our line of Parti’s and her personality is wonderful. This girl was born 20 September 2016. We are excited that this darling girl is part of an a continuation of the Barksdale Parti Line. Shandy has a fleece parti (chocolate and white) coat (bbEe carries cream-white-red-apricot genes). Her coat is hypo-allergenic and non-shedding with a wonderful soft texture to it. This wonderful little Barksdale lives with her Guardian Family (Sullivan’s) in Hattiesburg, MS. Our thanks to Kristin of IvyLane Labradoodles for allowing this wonderful girl to be part of “Barksdale”. CAER Normal, vWD Clear, DNA Profile, bbEe, DM Clear, IC Clear, Parti sp sp, PRA/PRCD Clear, EIC Clear, PennHIP, OFA Elbows Normal, and OFA Thyroid Normal. Barksdale’s Jimmy Choo II is a Barksdale Multi-gen Australian Labradoodle (ALd) miniature in size with a beautiful appearance and companion oriented disposition. This beautiful “attractive” little girl was born 06 October 2016. We are thrilled about this darling little girl and are so pleased with her coat and personality. JoJo is a Small Miniature and is about 14.5 inches tall. This wonderful Dood lives with her Guardian Family (the Torres) in Brandon, MS.
JoJo has a fleece parti (chocolate and white) coat (bbEE carries the brown gene does not carry the black or cream-white-red-apricot genes) and a wonderful and loving personality. Her coat is hypo-allergenic and non-shedding with a wonderful soft texture to it. CBC, vWD Clear, DNA, bbEE, DM Clear, IC Clear, Parti sp sp, PRA/PRCD Clear, EIC Clear, PennHIP , OFA Elbows Normal, OFA Thyroid Normal. Barksdale’s Patches is a Barksdale Authentic Australian Labradoodle (ALd) miniature in size with a unique, beautiful, soft open fleece coat. Her mostly white coat is offset with gorgeous red patches that makes her beautiful as is her personality. This beautiful “attractive” little girl was born June 13, 2016. We are thrilled about this darling little girl and are very pleased with her coat and personality. Patches is a miniature. Patches has a fleece parti (red and white) coat (bbEE). Her coat is hypo-allergenic and non-shedding with a wonderful soft texture to it. This wonderful little Barksdale lives with her Guardian Family (Hunts) in Brandon, MS.
CAER Clear, CBC, vWD Clear, DNA, bbEE, DM Clear, IC Carrier, Parti sp sp, PRA Carrier, EIC Clear, PennHIP L.33 R.32, OFA Elbows Normal, OFA Thyroid Normal. Barksdale’s Sweet Olive is a Barksdale Authentic Australian Labradoodle (ALd) miniature in size with a beautiful, soft open fleece coat.The Sweet part of her name is so appropriate and is her personality. This beautiful “attractive” little girl was born March 28, 2016. We are excited about the future of this darling little girl and are thrilled with her coat and personality. Olive is a small medium. Olive has a fleece parti (chocolate and white) coat (bbEE carries the brown gene does not carry the black or cream-white-red-apricot genes). Her coat is hypo-allergenic and non-shedding with a wonderful soft texture to it. This wonderful little Barksdale lives with her Guardian Family (Craigs) in Natchez, MS.
CBC, vWD Clear, DNA, bbEE, DM Clear, IC Clear, Parti sp sp, PRA Clear, EIC Carrier, PennHIP, OFA Elbows Normal, OFA Thyroid Normal, & CAER Normal. Barksdale’s Frozen Elsa is a Barksdale Authentic Australian Labradoodle (ALd) miniature in size with a beautiful, soft coat that matches her personality. This beautiful “attractive” little girl was born April 01, 2015 but certainly not an April Fools Joke. We are excited about the future of this darling little girl and are thrilled with her coat and personality. Elsa weighs about 18 pounds and is about 16 inches tall. Elsa has a fleece parti (chocolate and white) coat (bbEE carries the brown gene does not carry the black or cream-white-red-apricot genes) and has a wonderful pleasing personality. Her coat is hypo-allergenic and non-shedding with a wonderful soft texture to it. IC Clear, EIC Clear, bbEe, sp sp, DM Clear, vWD Clear, CAER Normal, DNA Profie, OFA Elbows Normal, OFA Thyroid Normal, PennHIP, PRA Clear. Barksdale’s Midnight In Paris is a Barksdale Authentic Australian Labradoodle (ALd) miniature in size with a beautiful appearance and companion oriented disposition. This beautiful “attractive” little girl was born September 12, 2014. We are excited about the future of this darling little girl and are thrilled with her coat and personality. Paris weighs about 16 pounds and is about 14.5 inches tall. 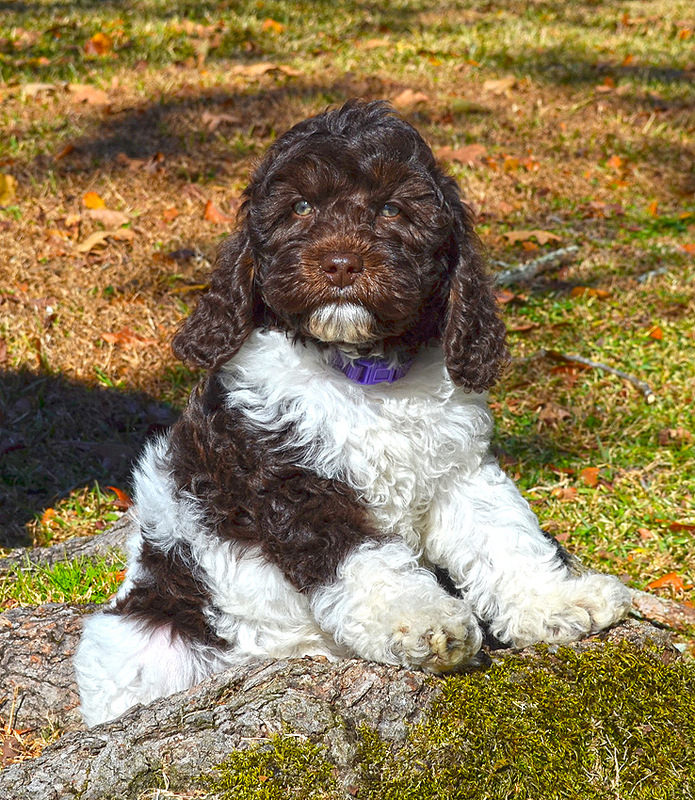 This wonderful Dood lives with her Guardian (Johnson) in Brookhaven, MS.
Paris has a fleece parti (chocolate and white) coat (bbEE carries the brown gene does not carry the black or cream-white-red-apricot genes) and a wonderful and loving personality. Her coat is hypo-allergenic and non-shedding with a wonderful soft texture to it. CAER Normal, CBC, DNA Profile, vWD Clear, bbEE, & sp sp, EIC Carrier, DM Clear, IC Clear, PRA/PRCD Normal, PennHIP , OFA Elbows Normal, and OFA Thyroid Normal. Barksdale’s Hudson Banks Teasly is a Barksdale Authentic Australian Labradoodle (ALd) medium in size with a beautiful, soft open fleece coat. He is a very special boy who will bring great things to BK;s Parti Line. . This beautiful “attractive” guy was born 17 April, 2018. We are excited about the future and what he brings to Barksdale’s outstanding line of Partis. Hudson has a fleece parti (chocolate and white) coat (bbEe carries cream-white-red-apricot genes). His coat is hypo-allergenic and non-shedding with a wonderful soft texture to it. “Hudson” is part of Barksdale’s Guardian Program. “Hudson” lives with his guardian family “The Teasly’s” in Braxton , MS. Our thanks to Kristin of IvyLane Labradoodles for allowing this wonderful boy to be part of “Barksdale”. CAER Normal, vWD Clear, DNA Profile, bbEe, DM Clear, Kb Kb, Carries Tri Color Black/Tan, IC Clear, Parti sp sp, PRA/PRCD Clear, EIC Clear, PennHIP, OFA Elbows Normal, and OFA Thyroid Normal. Ivylane Rob Roy is a Barksdale Authentic Australian Labradoodle (ALd) small medium in size with a beautiful, soft open fleece coat. He is so appropriate for our line of Parti’s and he is the next generation. This beautiful “attractive” guy was born 20 September 2016. We are excited about the future and what he brings to Barksdale’s outstanding line of Parti’s. Rob is a small medium. Rob Roy has a fleece parti (chocolate and white) coat (bbEe carries cream-white-red-apricot genes). His coat is hypo-allergenic and non-shedding with a wonderful soft texture to it. Our thanks to Kristin of IvyLane Labradoodles for allowing this wonderful boy to be part of “Barksdale”. “Olaf” has that wonderful full of life personality that says “here I am – let’s have fun, and then I will cuddle with you.” Olaf is a gorgeous Barksdale Parti with a super coat and is the male extension for “Barksdale’s” line of chocolate base Partis – bbEe does not carry the black gene, carries the brown and cream-white-red-apricot genes. This guy is a Miniature multi-Gen Miniature Australian Labradoodle (ALd). His birthday is Sept 12, 2014. This youngster will be an important part of the Barksdale Parti Lines. “Olaf” is part of Barksdale’s Guardian Program. “Olaf” lives with his guardian family “The Webb’s” in Jackson, MS.
MG Australian Labradoodle – Chocolate Parti. 16.5″ tall and 21 lbs, fleece coat. vWD Clear, CAER Normal, DNA Profile, sp sp, bbEe, EIC Carrier, DM Clear, IC Clear, PRA/PRCD Clear, CBC, PennHIP L.36 R.34, OFA Elbows Normal, & OFA Thyroid Normal. “Razmataz” has that same wonderful temperament that we demand in all our Barksdale Australian Multi-Generational Labradoodles. Raz is a wonderful Parti with a super coat and is the male basis for “Barksdale’s” line of chocolate base Partis – bbEE carries the brown gene and does not carry the black or cream-white-red-apricot genes. This guy is a Sm Medium Multi-Gen Miniature Australian Labradoodle (ALd). His birthday is May 01, 2013 and is the stalwart of our Parti Lines. “Raz” lives with his guardian family Gerdes” in Atlanta, GA where he can most often be seen cheering for his guys at their Ball Games. Raz comes to us from Rivermist Labradoodles and is a wonderful addition to Barksdale’s Line of Australian Labradoodles. Raz has that “Look At Me”in his eyes. 17″ tall and 24 lbs, fleece coat. PennHIPP, PRA clear by parentage, OFA Thyroid, OFA Elbows, vWD, CAER Normal, EIC Carrier, IC Clear, DM Clear, & CBC.